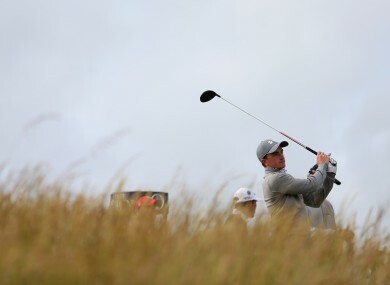 IRISH AMATEUR PAUL Dunne is off to a sensational start on day one of the Open at St Andrews. Dunne took advantage of his early tee time to make four birdies in a near-perfect start. The Greystones golfer sits on four-under after nine holes, two shots behind the early leader David Lingmerth of Sweden. Dunne, 22, opened with back-to-back birdies on the first and second before adding another at the par-five fifth. He then rounded off his brilliant front nine by rolling in a birdie three at the ninth. Graeme McDowell is on level par thru two holes, while Shane Lowry is on +2 thru four. Email “Irish amateur Paul Dunne is off to a sensational start at the Open”. Feedback on “Irish amateur Paul Dunne is off to a sensational start at the Open”.